Rose City Antifa has been tracking a number of white supremacists and fascists that show up to Joey Gibson’s rallies. Some of these we have written about, like Jeremy Christian, Jake Ott, Tim Gionet, Raul Gonzalez, The Traditionalist Workers Party, and the Proud Boys, as well as a number of others. Others, we continue to track, collecting as much useful information as possible on their activities and associates, before we expose them for what they are. Today we would like to introduce Jeffery Wade Hughes Jr. (aka Jeffery Hoggat). 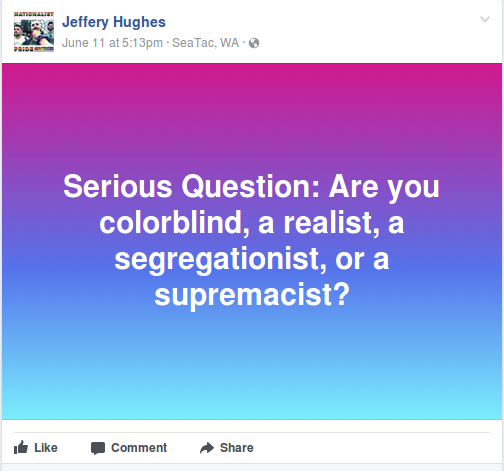 Hughes is a white supremacist and a fascist from the Seattle area. 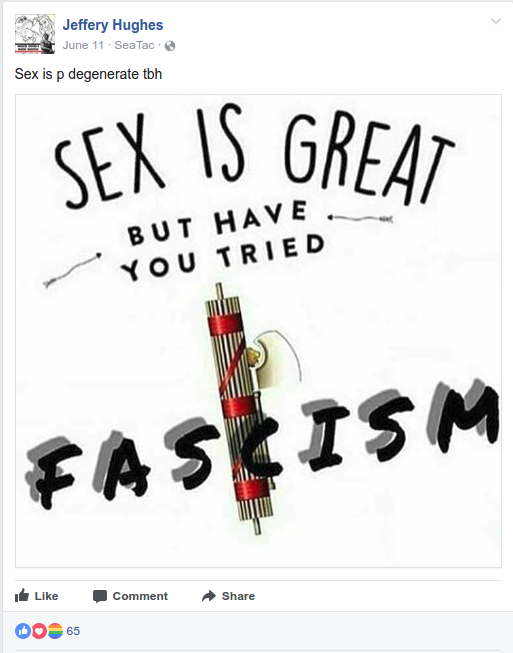 He is very public about his politics, and posts a variety of racist and fascist memes on his Facebook profiles. Hughes is, unfortunately, a perfect example of the sort of fascist that is allowed to hide in plain sight at these far-right events. 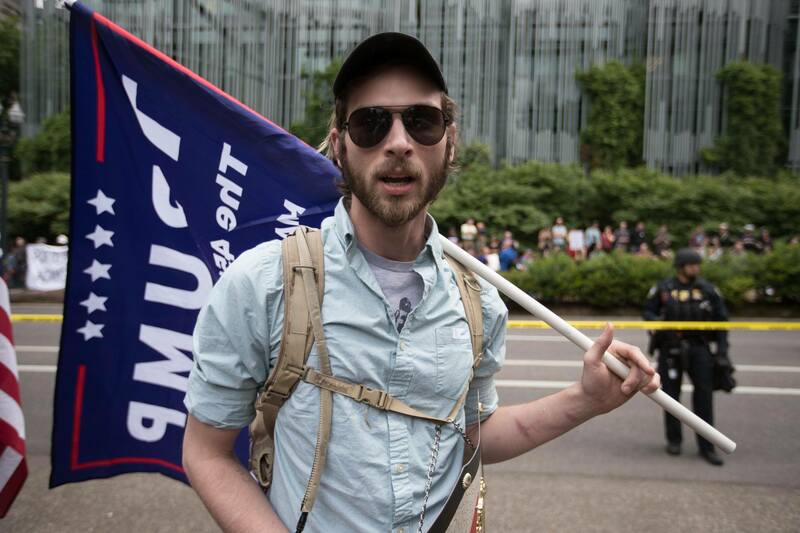 Hughes hid his fascism behind a Trump flag on June 4th. 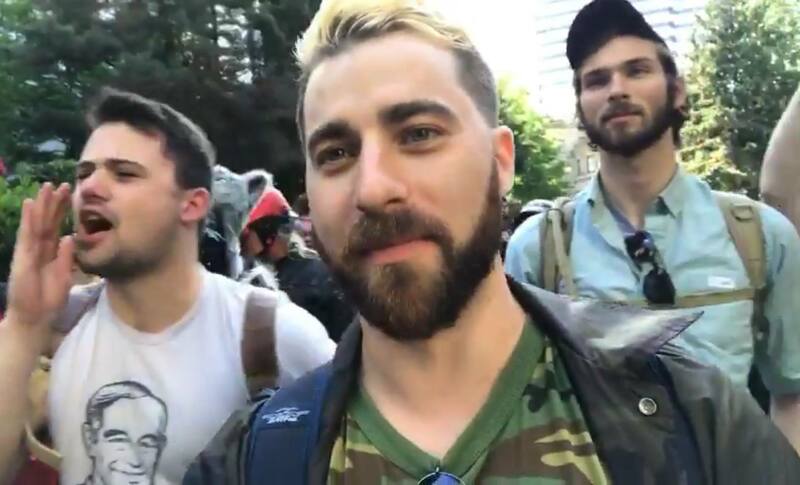 Hughes attended Gibson’s June 4th rally, where he (on the right, in photo below) was seen standing with the invited keynote speaker, anti-semite Tim Gionet (center), as well as with alt-right YouTuber James Allsup (on left). He plans to attend Joey Gibson’s rally in Portland on August 6th, and Gibson’s rally in Seattle on August 13th. 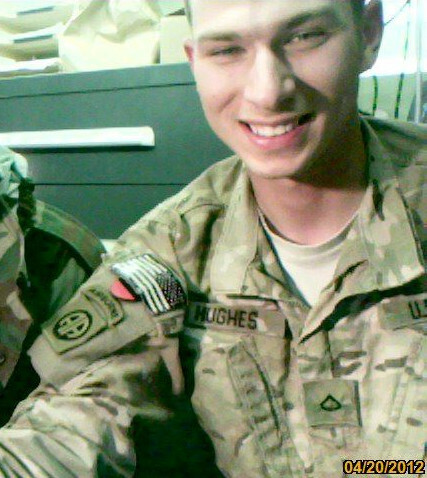 Hughes served in the 82nd Airborne. He is trained as a chef. He is a Mason, and he is an Oath Keeper. But above all else, Hughes is a racist and a fascist. 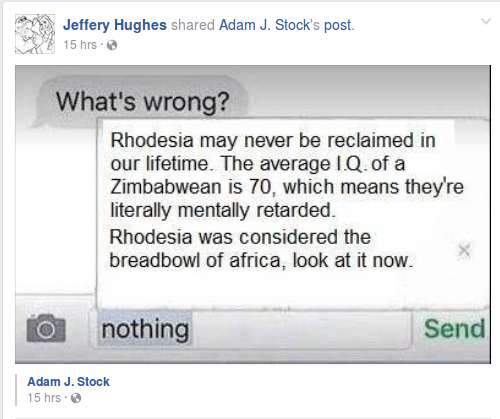 Above is a racist post Hughes’ shared, in support of the late 1960s white nationalist uprising in what is now Zimbabwe. Rhodesia is a popular theme with white supremacists, like mass murderer Dylann Roof. 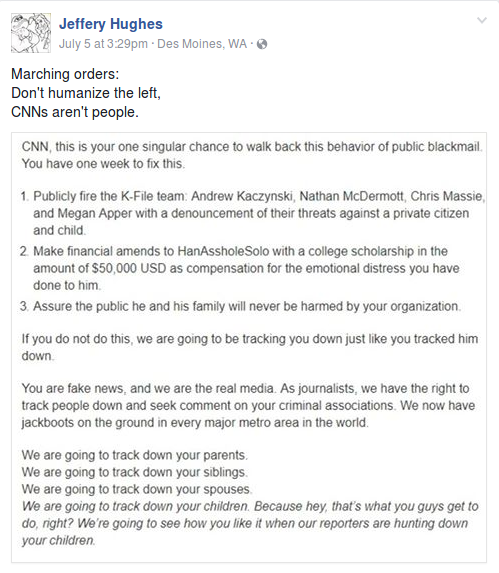 In the above post, Hughes copies text from the neo-nazi site DailyStormer, which threatens CNN employees and their families. In this post above, Hughes asks his friends which racist theory they personally identify with. Hughes makes the case for believing in segregation, while some of his friends believe that other races should be exterminated. Militia groups like the Oath Keepers have long maintained that they do not allow fascists or racists in their ranks. 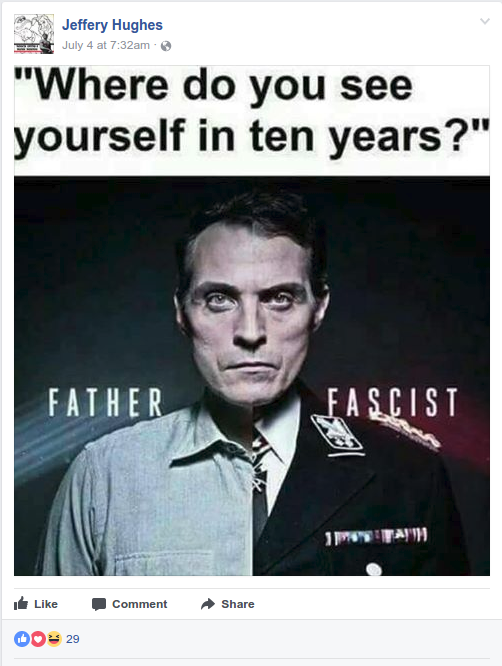 However, on his Facebook Hughes engages in a public discussion of how he wants to work with the Oath Keepers in order to gain support for white nationalists within the police force and government, until the time when they can create a fascist state. 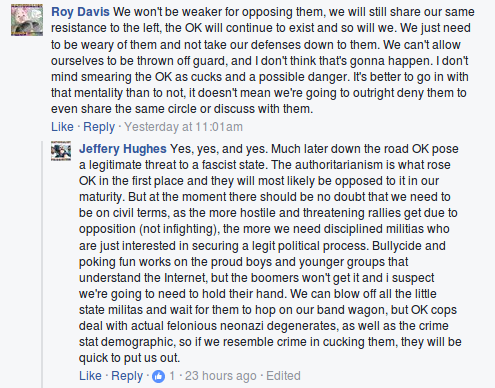 Only at this point, says Hughes, will the Oath Keepers likely turn against the fascists and become a liability to his movement. 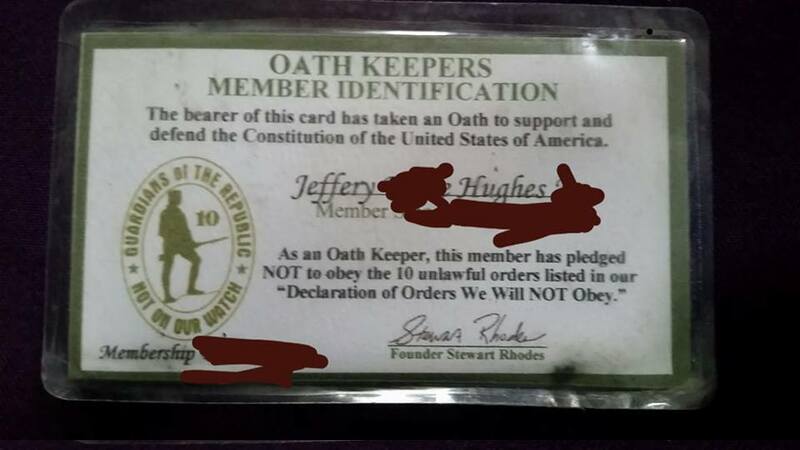 Other fascists disagree with Hughes however, and believe that the Oath Keepers are not helpful to their mission of instituting fascism in the United States. “We need to be weary [sic] of them and not take our defenses down to them. We can’t allow ourselves to be thrown off guard, and I don’t think that’s gonna happen. I don’t mind smearing the OK as cucks and a possible danger. It’s better to go in with that mentality than to not,” responds Roy Davis. 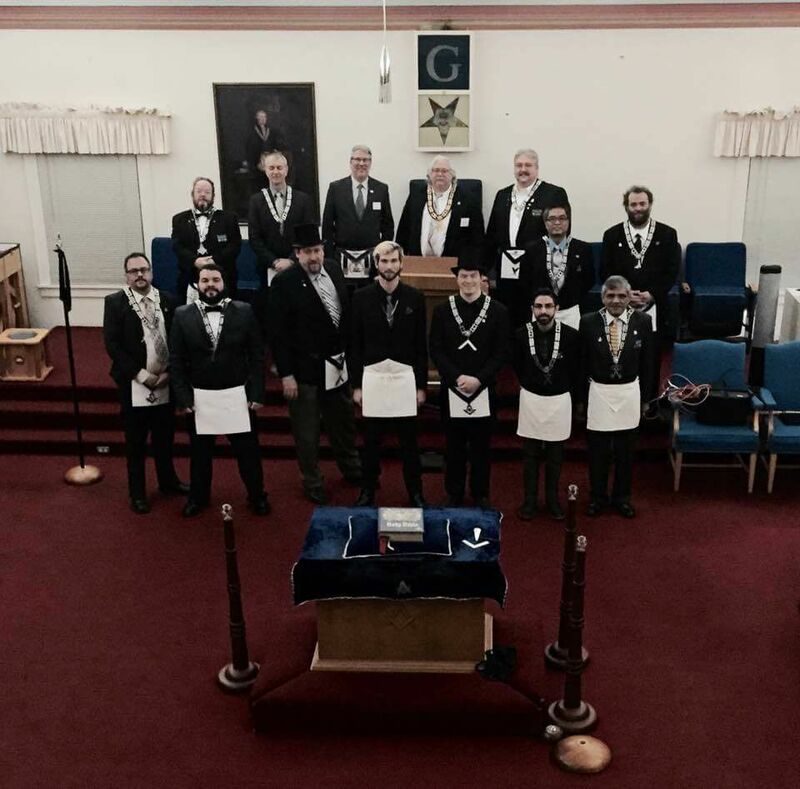 In the image below, Kathryn Townsend, the governor of American Freedom Warriors LLC as registered with the State of Washington, extols the virtues of affiliation with Patriot Prayer and AFW, which Hughes echoes. Without Joey Gibson’s events and the protection afforded by AFW, fascists like Hughes would have very little space to organize. Fascist white supremacists will not stop coming into our communities, as long as far-right organizations like Patriot Prayer continue to hold open the door. Hughes is particularly dangerous because of his military experience, and his work infiltrating the Oath Keepers militia. 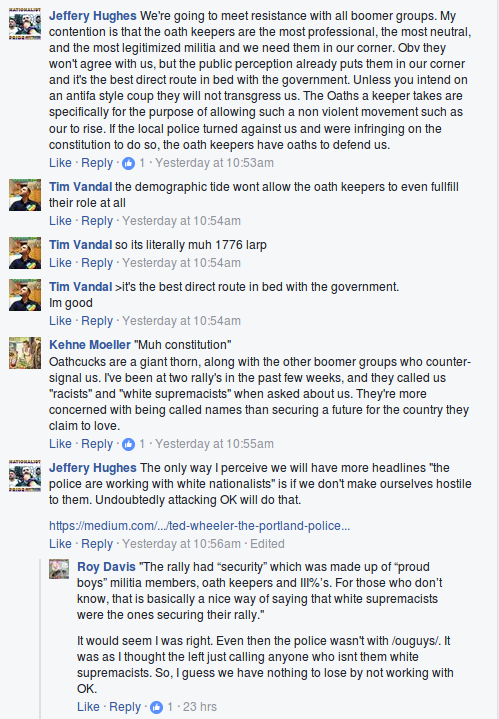 This is the same militia that the Multnomah County GOP is allowing to run “security” for their events. Hughes has explicitly said that it is his aim to ally the police and militia organizations with white nationalists. Joey Gibson and the GOP, by allowing people like Hughes a place at their events, are aiding Hughes’ goal of establishing a fascist state. 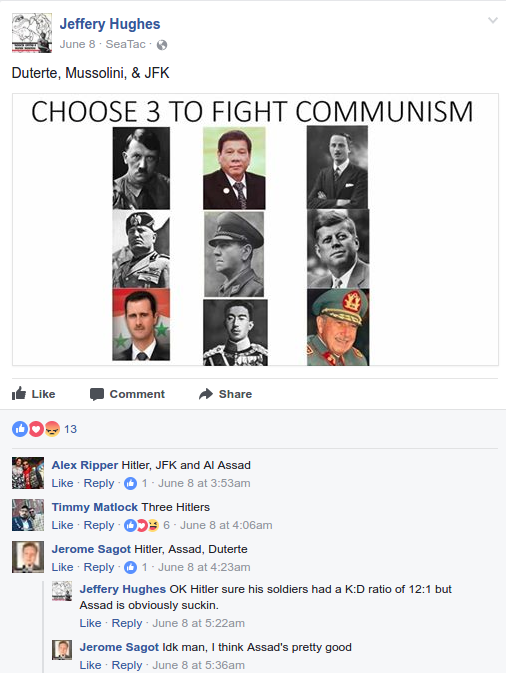 When the Joey Gibson, the American Freedom Warriors, and the GOP place themselves as opposed to anti-fascists, this makes them pro-fascist. Nothing could make this clearer than Hughes’ presence at far-right events in the Portland area and beyond. 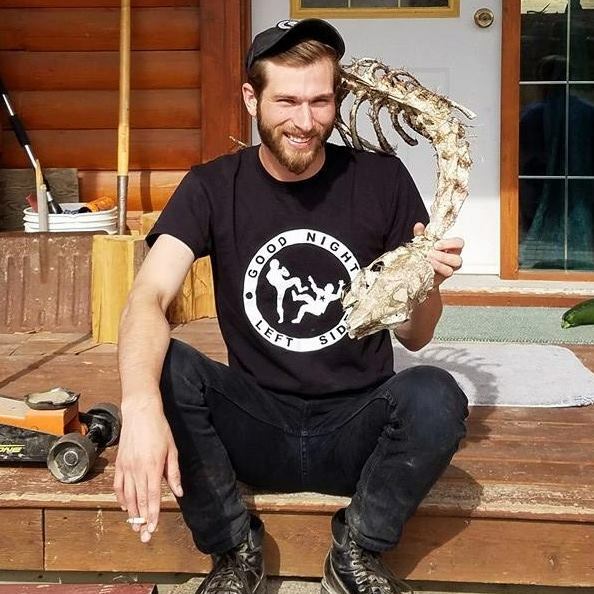 Hughes is also associated with several rising Pacific Northwest white supremacist groups that Rose City Antifa is currently tracking. We will publish more information about these associations in the coming weeks. 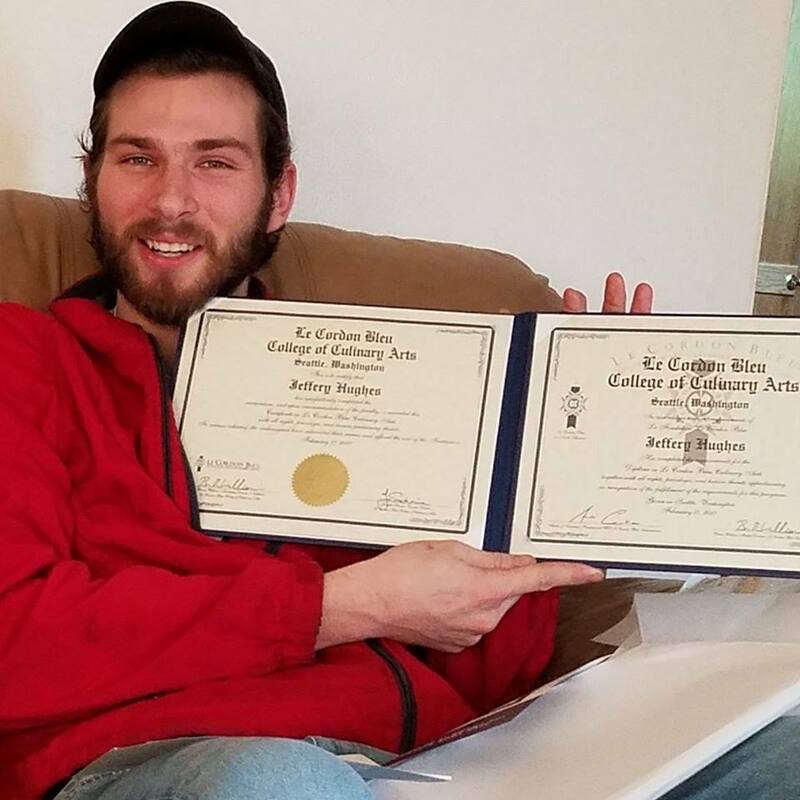 Here is some other information about Jeffery Hughes. If you have more information about Hughes or other white supremacists and fascists in your area, please contact us at fight_them_back@riseup.net. Full name: Jeffery Wade Hughes Jr.